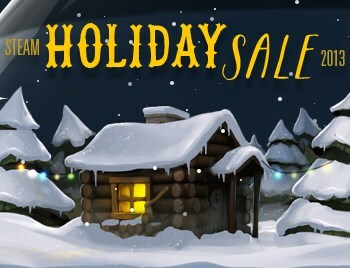 The holiday season is here and you know what what means: Steam sale! I'm just going to come out and say it: This whole "Steam sale" business is getting a little tiresome. Sales are great and there's some good stuff up for grabs, but it seems like every time you turn around there's a new Steam sale on. How much money do they think we have? Anyway, to the point - the 2013 Steam Holiday Sale! Daily Deals, Flash Sales, regular sales, a bunch of stuff mixed in that's still full price and the Community Choice that lets users vote on a new sale every eight hours. The Fallout Collection is five bucks! Borderlands is five bucks! Plants vs. Zombies GOTY Edition is five bucks! Dead Island GOTY is five bucks! Are you seeing a pattern here? Well forget it, because BioShock Infinite is ten bucks! Which is still a pretty good deal for anyone who hasn't already played it. Valve is also offering a bunch of Holiday Sale Snow Globe Trading Cards that can be crafted into a Holiday Sale Snow Globe Badge, which will earn you some "limited edition" stuff and a free game item - or five if you craft a foil badge! I'm not sure how you get foil over the internet, but I'm old and still mad that I can't buy games in boxes anymore. The thrill may not be what it once was but there are still a lot of sweet deals on tap (Woodcutter Simulator 2013 for $7.49, and I am totally not making that up) so if you've still got a little bit of coin lying around and some time to kill over the next couple of weeks, you can give it up to Gabe at Steam. UPDATE: The article originally stated that collecting Snow Globe Badges would earn a free game, which was incorrect - they will earn you a free item for use in certain games.